Anyone who is a teenager, has a teenager or ever was a teenager can fully understand what the experts say: those teen years are difficult. Young people, perhaps more so today than in the past, are stressed, anxious and overwhelmed. A recent afterschool.com poll asked tens of thousands of high school students how often they feel stressed; nearly 45 percent reported "all the time." Lafayette native Megan Gallagher can certainly relate. The 2014 Acalanes High School graduate spent years dealing with anxiety issues. It started when she was as young as 11 years old, Gallagher remembers. "I got upset a lot, freaked out, worried," particularly before events such as sleepovers or field trips, she said. Her anxiety really "started kicking up" when she began high school. "I was having actual panic attacks in class," Gallagher noted. There were numerous trips to the nurse's office. "I thought I was dying. I was feeling awful and it was really hard for me to focus in class. It's just so scary when you don't know what's going on." Gallagher's parents, who, she said, are "seriously the best people," were extremely comforting and supportive at this difficult and confusing time. They assured her she'd get through this and would, indeed, be OK. With their help, Gallagher began therapy and "had a really positive ex-perience. It made me feel like I could talk to someone," she said. "I could tell them exactly how I was feeling and get an unbiased opinion. When I kept my feelings inside, I would wonder why was I having such crazy thoughts. But when I would take the words out of my head and tell them to someone, well, it's such an incredible feeling." She also journaled her feelings every day, ate healthy, exercised regularly, practiced breathing techniques and meditated. By the time Gallagher finished high school, she was feeling far less anxious. "I had learned so much through therapy," she said. "You have to put in the work if you want to feel better." Deciding that a four-year college wasn't right for her at the time, Gallagher moved to Southern California to attend community college. Even then, she said, she really wasn't happy, remembering that "something just felt `off.'" And then she had a serious health scare. Months of constant pain, misdiagnoses and almost 30 different antibiotics followed before Gallagher found the right practitioner who offered the right diagnosis and, more importantly, the right antidote to make her feel healthy again. Her diet changed drastically and, Gallagher believes, that really helped her feel better, happier and far less anxious. A spiritual person, Gallagher trusts that "everything happens for a reason." Looking back, she believes her health issue was "a life awakening moment. It really inspired me to reevaluate my life and try to figure out what makes me happy, what brings me joy. Life is so short and so unpredictable and I wanted to turn my pain into my purpose." And she has. 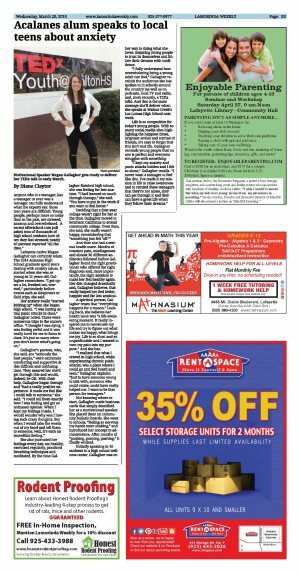 "I realized that what I craved in high school, while experiencing chronic panic attacks, was a place where I could go and feel heard and seen," Gallagher explains. "Just to have someone young to talk with, someone who could relate, could have really helped me. I want to be that person for teenagers." Not knowing where to start, Gallagher made business cards that simply described her as a motivational speaker. She placed them on community bulletin boards. She went to schools, "feeling so nervous my hands were shaking," and introduced her concept to administrators. After months of "pushing, pushing, pushing," it finally worked. Initially speaking to 10 students in a high school wellness center, Gallagher was on her way to doing what she loves: Inspiring young people to trust in themselves and follow their dreams with confidence. 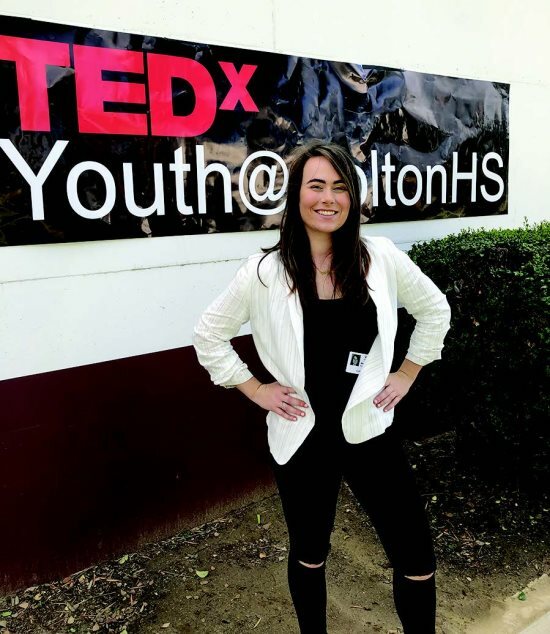 "I fully understand how overwhelming being a young adult can feel," Gallagher reminds the audiences she has spoken to in schools around the country (as well as on podcasts, local TV and radio, and, most recently, a TEDx talk). And this is the same message she'll deliver when she speaks at Walnut Creek's Las Lomas High School next week. Life is so competitive for today's young people. With so many social media sites highlighting the happiest times, brightest smiles and myriad of friends, it's easy to forget that this isn't real life. Gallagher reminds young people that no one is perfect and everyone struggles with something. "I kept my anxiety and panic attacks hidden and I felt so alone," Gallagher recalls. "I never want a teenager to feel like this. I've made it my mission in life to raise awareness and to remind these teenagers that they're not alone, they can get through it and they can have a great life when they follow their dreams."